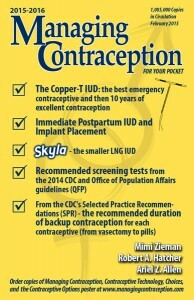 Thank you for your interest in our Managing Contraception Guide for your pocket. Here we will provide you with a look at what is inside of the Managing Contraception 2015-2016 book. If you have any questions please contact us. Get your copy of Managing Contraception today, just order conveniently online.